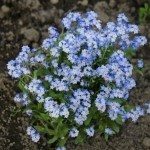 When do you plant Forget Me Not seeds? Great info on the care of Forget Me Nots but it doesn't mention when to plant the seeds? You should start your seeds in early March indoors. Follow the instructions on the seed packet for seed germination.